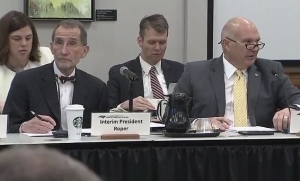 In his first UNC Board of Governors meeting as interim president of the UNC system, William Roper tackled some of UNC’s thorniest issues – including the future of the “Silent Sam” Confederate statue. “Although I was not supportive of the way the monument was taken down in August, my personal position is we should not be putting the monument back on McCorkle Place,” Roper said in a press conference after Friday’s board meeting. Though Roper didn’t say whether that would preclude the statue from returning anywhere on the Chapel Hill campus, simply saying it should not return to its original site may be enough to ruffle some feathers on the board. Several members have insisted the statue, toppled by protesters in August, must be returned to its original place at the heart of the campus. UNC-Chapel Hill Chancellor Carol Folt ordered the base of the statue removed earlier this month, just before she surprised the board by announcing her resignation. Several members of the board – including Chairman Harry Smith – said Folt overstepped her authority by giving that order. Others have suggested she broke a 2015 law on the preservation of such monuments. Interim UNC President William Roper and UNC Board of Governors Chairman Harry Smith during Friday’s meeting of the board. The board voted Friday to give Roper the authority to begin negotiating Folt’s exit package. He is already looking for an interim chancellor and is meeting with students and faculty to get input. In prepared remarks Friday, Roper provided a window into how he will make the decision. Roper said he expects the interim chancellor, which he will choose by the end of January, may need to be in the job for up to 18 months while a full-time chancellor search is conducted. “We are not in the business of micromanaging our key leadership,” he said. Micromanaging was a common description of the sort of board of governors behavior Folt and outgoing UNC President Margaret Spellings faced during their tenures, leading to the conflicts with the board many have speculated led to their abrupt exits. Faculty, staff and national experts predict finding the next leaders for both Chapel Hill and the UNC system will be difficult given that recent history.